A person who was barricaded inside a Denny's in Campbell is now in police custody following an 11-hour standoff. Anoushah Rasta reports. A person who was barricaded inside a Denny's in Campbell is now in police custody following an 11-hour standoff. The incident started around 5:30 a.m. Friday when police responded to a report of a person with a gun at the restaurant on Bascom Avenue. The armed person had confronted a worker in the parking lot of Denny's near the Pruneyard shopping area just east of Highway 17, Campbell Police Capt. Gary Berg. After the confrontation, the person went inside the Denny's where they stayed until police were able to detain them around 4:30 p.m. Police were able to safely evacuate all the workers and other people who were inside the restaurant. No injuries have been reported. 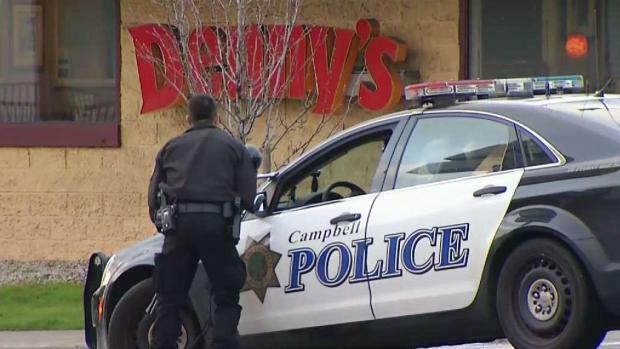 Campbell police said an armed man barricaded himself inside the Denny's on Bascom Avenue Friday morning after a confrontation with a worker. Police were able to safely evacuate everyone else who were inside the restaurant. Campbell police officers during the standoff were seen surrounding the restaurant with their guns drawn. Berg said the suspect, who has not yet been identified, didn't appear to know the worker. "There was no verbal argument. Nothing to indicate they knew each other, for some reason he just pulled out a gun," he said. A hostage negotiation team also responded to help get the person to safely come out and surrender. Bascom Avenue was closed from Campbell to Dry Creek, police said.